Perfectly situated on the edge of the Great Barrier Reef, amongst Queensland’s 74 Whitsunday Islands, Hamilton Island offers an experience like no other: glorious weather, azure waters, brilliant beaches, awe-inspiring coral reefs, fascinating flora and fauna, fine food and wines, and activities almost too numerous to mention. Now this is a great place to vacation! This fabulous island stay includes 7 nights at the luxury 5 star resort of ‘qualia’ on Hamilton Island. ‘qualia’ is a truly special place where everything has been meticulously considered to relax the mind and completely spoil the senses. Located around the northern tip of the island, you will enjoy fabulous sunsets over the Coral Sea from your Pavillon's spacious sundeck. Aspire Bonus – Stay for 7 nights and pay for 6 nights! Get one FREE night - up to a value of $1550! -Aspire Bonus - Enjoy a Sunset cruise valued at $240 aboard the Atomic MV Pebble Beach - qualia's custom-built 45ft luxury cruising vessel. This is a great way to experience sailing around the sheltered waters surrounding Hamilton Island, while enjoying canapes and sipping a glass of champagne. qualia’s north-facing Windward Pavilions each complete with its own private plunge pool, provide flawless design, soothing decor and expansive Coral Sea and Whitsunday Island views. Shaded by Eucalypts, the Windward Pavilions’ breezy louver windows, polished timber floors and floor-to-ceiling glass provide a uniquely Australian hideaway. Wake to the breathtaking views of the Coral Sea outside your window, then step from the beautifully appointed living room onto the north-facing sundeck to bathe in the private infinity-edged pool. Freestanding and spacious, with expansive waterfront views, the Hamilton Islands luxury accommodation provided by the Windward Pavilions at qualia have a sunny northern aspect and provide four times the living space of a standard hotel room. Fly Virgin Australia to Hamilton Island via Sydney or Brisbane from $1700 per person or upgrade to premium economy or business class - ask an Aspire consultant for a quote for your dates. Seating in Business Class is luxurious and spacious, with a generous 77 inch pitch on long haul seats, which convert into fully horizontal flat beds. 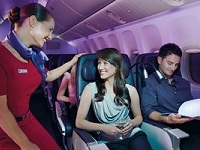 Seats on short haul flights are also spacious but have a pitch of 38 inches and do not fully recline. Passengers have unlimited access to the Luke Mangan designed menu and premium Australian wines, as well as personal seat-back entertainment. Other benefits include priority check-in, lounge access and extra baggage allowance. Valid for stays at qualia between 01 April 2013 - 22 August 2013, 01 September 2013 - 21 December 2013 & 06 January 2014 - 31 March 2014 . Prices are per person based on double occupancy. Hotels are subject to availability. All prices reflect a discount for purchases made by cash/wire transfer/check, please see terms and conditions for credit card payments. There are no discounts for payment made by credit cards. Cancellation penalties and other restrictions apply.